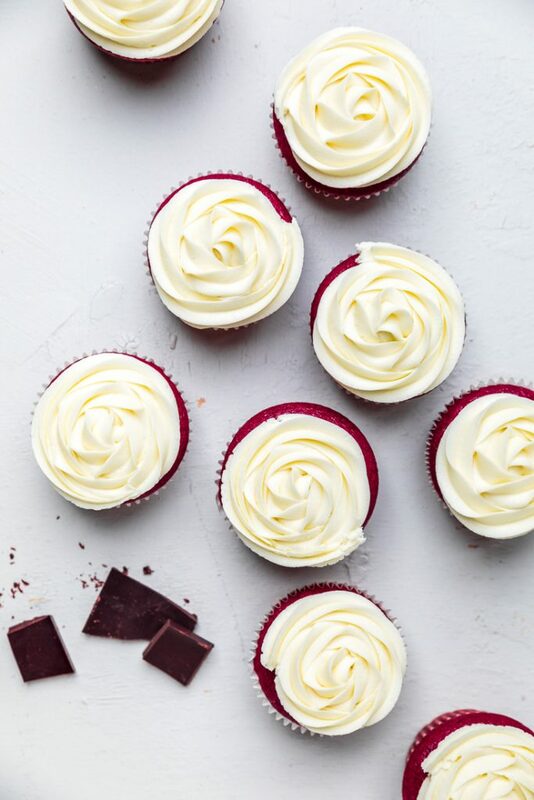 These dairy free red velvet cupcakes will rock your world! 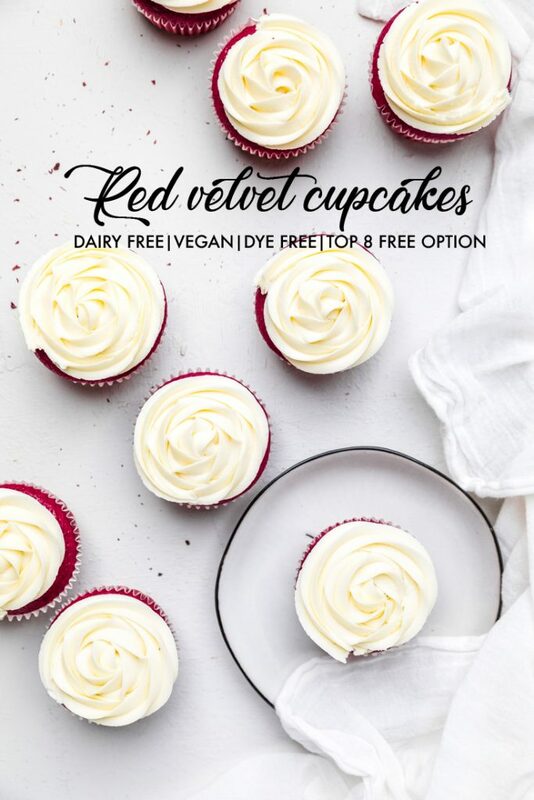 Just one bowl needed for these soft, delicious dye free dairy free red velvet cupcakes! Also vegan! Whether it’s Valentine’s Day, Christmas, or just a random day, every once in awhile you may be looking for a red desserts. Most of the time that leads to one looks for red velvet recipes. 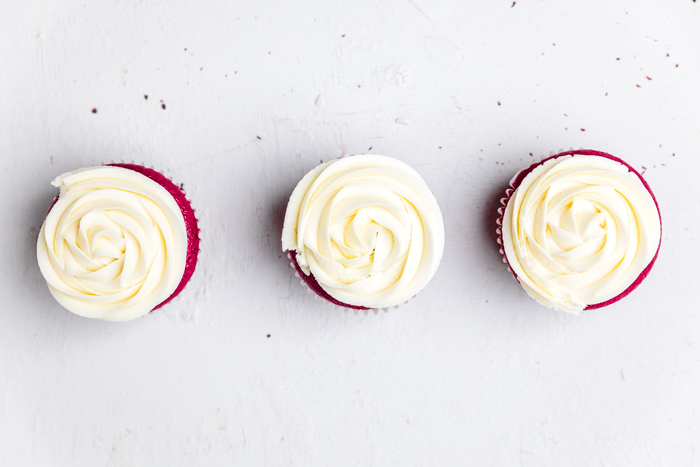 As you may know, red velvet cupcakes are not traditionally dairy free. However, today that all changes when you try these dye free, dairy free red velvet cupcakes. This is also a completely vegan red velvet cupcakes recipe. Many times, when a person, especially a child, has a food allergy, they also react to food dyes. Because of that we wanted to ensure that not only were these dairy free red velvet cupcakes, but that they were also dye free dairy free red velvet cupcakes. 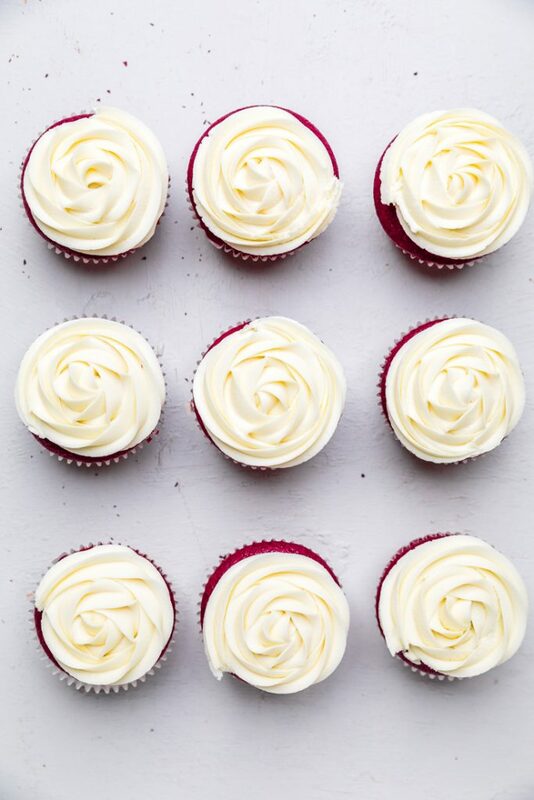 What ingredients do you need to make Dairy Free Red Velvet Cupcakes? 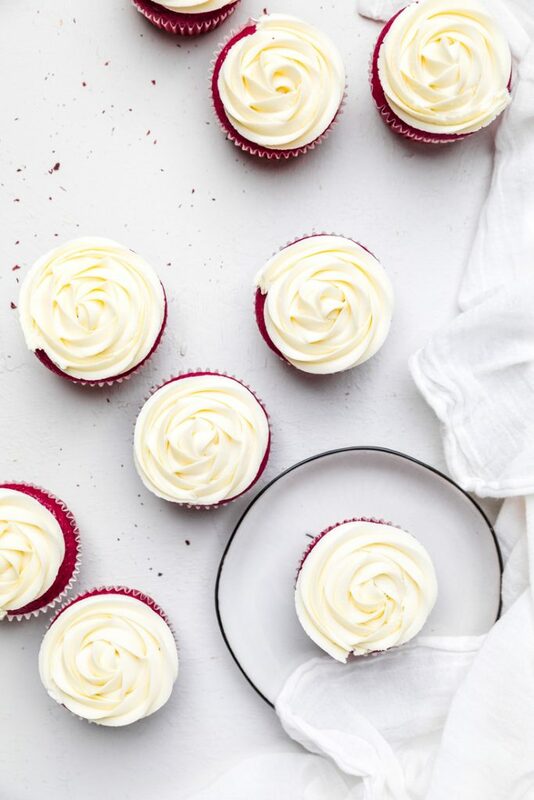 These dairy free red velvet cupcakes are made in just one bowl. 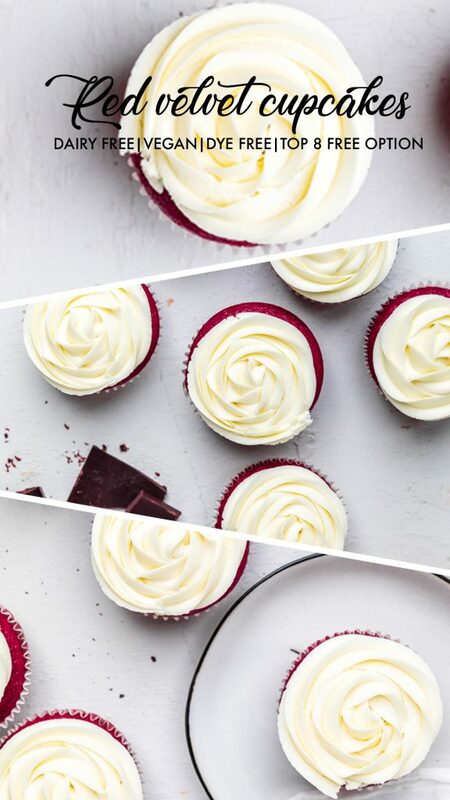 You need 13 ingredients to make these vegan red velvet cupcakes. 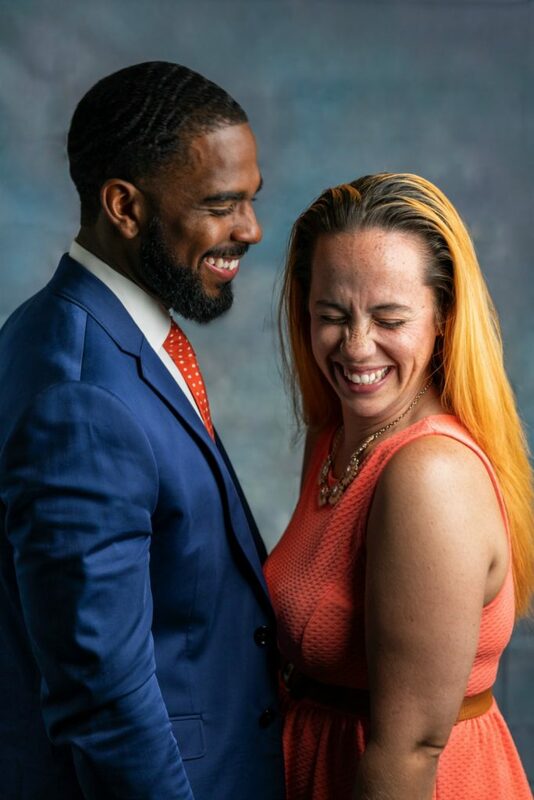 I absolutely love how quickly they come together and that there isn’t anything hard to find. How do you make Dairy Free Red Velvet Cupcakes? These dye free, dairy free red velvet cupcakes are super easy to make. They only need one bowl to make the entire recipe which is #winning when it comes to doing the dishes later. To start making this recipe you are going to add the sugar with all the liquid ingredients. Beat with a mixer very well. After the liquid ingredients are blended well, then you are going to add all the dry ingredients. You should have red batter at the time this is done. If you would like the red a little more intense for your dairy free red velvet cupcakes, then you can a little more beet juice, not to exceed an additional 1/4 cup. *Please note that this will not be as intense of a red as you may be used to since natural dyes are not the same as artificial. Let your mixture sit for 5 minutes. During that time, either grease your cupcake pans or add in paper cupcake holders. The batter will make 12 dairy free red velvet cupcakes. Pour the batter into each cupcake holder until it is approximately 3/4 of the way full. Place baking sheet into a preheated oven at 350 degrees for 17-20 minutes. A toothpick inserted into the middle should come out clean when done. Once the cupcakes are done, let cool completely before putting cream cheese or other frosting on top. 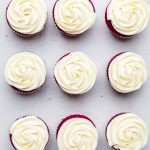 How can I make these Dairy Free Red Velvet Cupcakes Top 8 Allergy Friendly? For the flour, you can just replace with a gluten free cup for cup flour (we like this gluten free flour). They will turn out more dense than a normal cupcake. For the tree nut allergies – replace the almond milk with any dairy free unsweetened milk that you are able to have. Lastly, you can swap out the coconut oil for another mild oil – I would suggest like a grapeseed oil or vegetable oil. I can’t find beet juice for these dairy free red velvet cupcakes. What’s my alternative? Once you have perfected these dairy free red velvet cupcakes, you may be looking out for other delicious dairy free desserts. Here are some dairy free dessert recipe ideas. In a bowl, add the first 8 ingredients to a large bowl and beat until well combined. Then, all the dry ingredients, the remaining five. Grease or place paper cupcake holders in a cupcake tin. Fill each cupcake tin with batter approximately 3/4 full. Place in preheated oven for 17-19 minutes. A toothpick inserted should come out clean. Remove and add desired frosting. Beat together cream cheese and vegan shortening until combined. Add in the remaining ingredients until well blended. Place in fridge until ready to use.